WWYD: What Would Yeshe Do? Also available through or through the RSS feed. A Podcast dedicated to Yeshe Tsogyal, the Mother of Tibetan Buddhism. Edward Reib interviews Tshering Jamtsho in Bhutan regarding Nyingma and Drukpa Kagyu Buddhism, Gross National Happiness (GNH), The Great Unifier Ngawang Namgyal, The Divine Madman Drukpa Kunley, Tiger's Nest, and Yeshe Tsogyal, The Mother of Tibetan Buddhism. Edward Reib interviews Tashi Sangpo from the Sakya Guru Monestary in Ghoom, Darjeeling, regarding Tibetan Buddhism, Meditation, Thanka, Atisha Mind Training, and Yeshe Tsogyal, The Mother of Tibetan Buddhism. Edward Reib interviews two brother Thanka Painters, Robbe and Ajay Goyal, in Kathmandu Nepal. Edward Reib's second interview with Kess Frey. In this episode we discuss Chi Gong, The Five Dhyani Buddhas, Red Tara, and Yeshe Tsogyal, the Mother of Tibetan Buddhism. Edward Reib interviews Kess Frey about the life and legacy of Yeshe Tsogyal, the Mother of Tibetan Buddhism. Lindsey Kimura and Edward Reib interview Ian Baker regarding The Heart of the World and other Beyul, working with The Dalai Lama, the Jungian Shadow, The Art of Tibetan Healing, and present day devotees of Yeshe Tsogyal, the Mother of Tibetan Buddhism. In the 8th century CE, Trisong Detsen, known as The Second Dharma King, sent for the then famous Padmasambhava ("Born of the Lotus") and other Indian scholar-monks to bring Vajrayāna Buddhism into Tibet. Padmasambhava's principal student and disciple was the Tibetan Queen Yeshe Tsogyal, the wife of Trisong Detsen. After a time, Padmasambhava left Tibet and returned to India, and Yeshe Tsogyal became the primary source of his teachings. Developing among the Mahasiddhas ("Great Adepts") of India beginning in the 3rd century CE, Vajrayāna was the third major development of Buddhism after the original Śrāvakayāna (also called "Hinayana"), and Mahayana. Vajrayāna is known as "The Quick Path" and can be directly translated as both "Diamond Vehicle" and "Thunderbolt Vehicle". 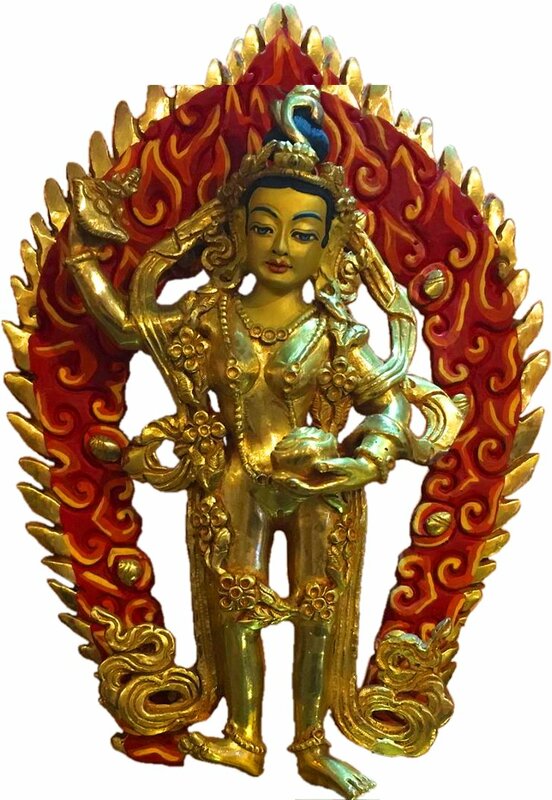 Many of the gods of Tibet's ancient Bön religion were incorporated into what we now know as Tibetan Buddhism and were re-branded as "Dharma-Protectors". These along with the Śrāvakayāna, Mahayana, and Vajrayāna Sutras from India, some influence from Chan (Zen) in China, the Madhyamaka tradition of Nagarjuna, the Yogācāra tradition of Asanga, and the logical and epistemological thought of Dharmakirti laid the foundation of the earliest form of Tibetan Buddhism which was retroactively named "Nyingma" ("Ancient"). This was the basis of the Tibetan Buddhist schools which followed: Kagyu ("Oral Lineage"), Sakya ("Pale Earth"), and Gelug ("Yellow Hat"). The Kagyu school is headed by the His Holiness the Gyalwang Karmapa and introduced the idea of the leader being a Bodhisattva who reincarnates again and again into that same role. The current Karmapa is said to be the 17th incarnation of the original Karmapa, Düsum Khyenpa. The Sakya school is currently headed by the 41st Sakya Trizin. In the Sakya school the leadership role is passed down through a hereditary system between the male members of the Sakya branch of the Khon family. Gelug is the most recent and well-known school of Tibetan Buddhism today, as it is that of His Holiness the Dalai Lama, said to be the 14th incarnation of the original Dalai Lama, Gedun Gyatso. The podcast What Would Yeshe Do? features interviews with guests who specialize in or have special interest in some aspect of Tibetan Buddhism. Ian Baker is very active in the Vajrayāna and Tibetan Buddhist communities worldwide, and is the author of the book "The Heart of the World" about his journeys and experiences in Nepal and Tibet. Kess Frey is a devoted to Yeshe Tsogyal specifically, and is a practitioner of Tibetan Buddhism. His path has let him to teach these principals, and meditation, to Christian communities by way of Contemplative Prayer. The brothers Ajay and Robbe Goyal specialize in painting a sacred form of Tibetan Buddhist art known as Thanka. Tashi Sangpo is a monk from the Sakya Guru Monestary in Ghoom. Tshering Jamtsho offers fascinating insight into the forms of Tibetan Buddhism which have flourished and continue to flourish in Bhutan.